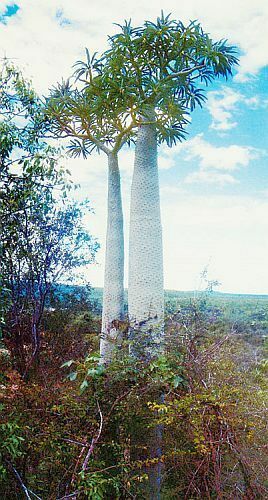 ﻿Pachypodium geayi is a madagascar palm native of Southern Madagascar. The deciduous leaves are very long, narrow and green with a light gray felt covering, most notably on the undersides. The leaves have a much lighter middle vein that has a rose tint to it and are more upright than Pachyspodium lamerii. The trunk is smooth grayish silver and may reach 30 feet in time. Spines are in clusters of three and are sharp and strong. The flowers of Pachypodium geayi are white and relatively small with an exposed anther cone in the center. Flowers will set in about ten years in good conditions.